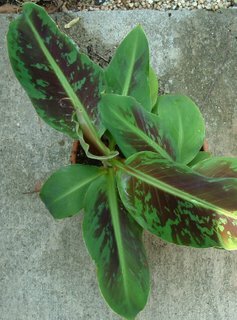 If you're looking for plants well suited to your area, one frequent piece of advice is to "grow native." Here's another tip- why not "grow what a native grows?" Neighbors can be a great resource, especially if you're new to a climate like me. 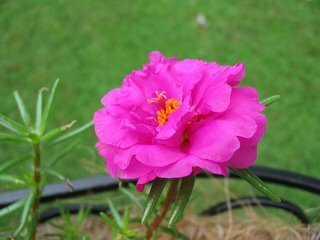 I was admiring my neighbor's backyard earlier this summer, and she raved about the "Moss Rose", or Portulaca grandiflora. 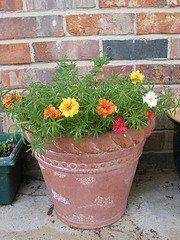 This year, I planted Portulaca in a particularly sunny location. The weather has been horribly hot and dry recently. And this little plant is thriving and blooming. No wonder my neighbor likes it so much! While the zinnias I put in nearby containers are struggling, the moss rose seems to be a great container plant. Yes, there are plants out there that thrive in hot, dry weather! Tune in next time for another edition of "Some Like it Hot." Have you ever planted some seeds, and then a few weeks later, when they start to germinate, you have no idea what you planted? I’m usually compulsive about labeling. Growing plants for laboratory research trained me well. And during this time I also got addicted to Sharpie markers. I think I label just for an excuse to inhale the Sharpie fumes. But I had a recent lapse. After a few days, and a few leaves, I remembered that I had soaked some lemon seeds overnight and poked them in moist (and unlabeled) potting soil. It took them a little while to sprout, but they’re coming along well! 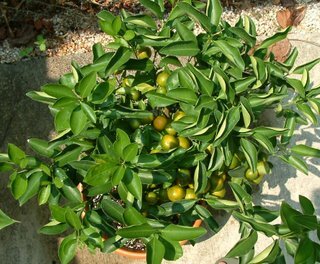 Since I first saw a lemon tree at a local conservatory as a child, I have been really fascinated with growing tropical fruit. So now that I’m all grown up and in a warmer climate, I can indulge my fruity tastes. I’m not sure how well they will overwinter, since we do get frost here, so they will eventually move into my garage with florescent lights. Maybe someday they will have a greenhouse home!?!? I’m still considering this, although we do have a rather long growing season here and I’m afraid it would involve too much work for upkeep. Any greenhouse gardeners care to comment? 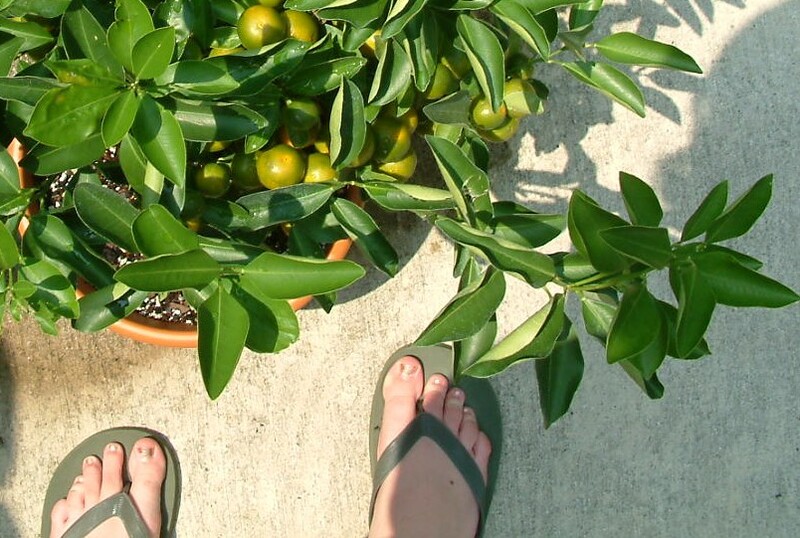 While these $5 Old Navy flip-flops are a summer fashion essential at the poolside, they DO NOT work in the Garden. As I’m slow to learn, we have these critters called fire ants down South. These ants are not stunned by my copper nail polish. Perhaps it just makes my toes look all the more tempting, like chocolates wrapped in golden foil. Romance isn't about fine dining and a dozen roses, it's the man who cares enough to stomp two dozen Japanese beetles that were dining on your rose bushes. I was really smitten that my husband not only watered the roses while I was gone, but also went the extra mile to protect them. What a man! Now that I'm home again, I'm getting aggravated watching the beetles happily munch away once again on my roses, and I'm still trying to devise a plan of attack. I've heard the traps will catch a lot of beetles, but in the process just attract more beetles to your yard and don't really solve the problem. I've heard people recommend Sevin, but I know that is really nasty stuff, and I've been trying to avoid chemicals as much as possible this year since I'm expecting, and I've also recently developed an affinity for bees. So spraying the beetles off with water and then stomping still seems like the best option. Some people recommend carrying a bucket of soapy water and shaking the beetles into the bucket. Personally, I find the crunching sound to be a little more satisfying, and the ants seem to take care of cleaning away the remains. I've also noticed that late at night or early in the morning the beetles tend to be more sluggish, so it's a good time to go in for the kill. Any other advice on taking on the Japanese beetles?